Tuningen, 30.09.2008 - Bulgin's popular Buccaneer range of connectors has been extended with yet another innovative product. The PX0839/90 is a 90° PCB mounting connector which us made for rear of panel assembly. This means that the connectors can be pre-assembled on PCB's prior to fixing to the panel, saving assembly time and reducing the need for internal wiring. 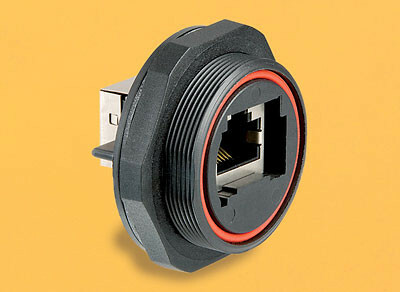 The Cat 5e shielded connector comes complete with a sealing gasket which ensures protection to IP68 when connected to a mating Buccaneer RJ45 cable connector.